Holidays to Luxembourg up to -70% off To take advantage of these offers, join now for free! Enjoy luxury holidays to Luxembourg with Voyage Prive and discover a unique blend of ultramodern cities, medieval towns and picturesque countryside, book online today. Taking the time to experience Luxembourg is like taking a step into another world. There is a unique blend of quaint, picturesque and beauteous landscapes and captivating towns and cities, all of which are mingled with the undertones of the contemporary feel of the business district, with its profusion of shopping malls and entertainment venues. This luxury holiday destination has something for everyone. Luxembourg is the wealthiest nation in Europe and the founding member of the European Union. It plays a very important role in European affairs and is home to many European Union institutions as well as being a major financial centre. The European Investment bank, for example, makes its home in the business district of Kirchberg, and well-known companies have their headquarters here, such as the internet call and video provider Skype, and chocolate maker Ferrero. Visiting Luxembourg City is like being part of a fairy tale with exquisite architecture fronting galleries, museums and other buildings of historical significance, including the Benedictine monastery of the 17th Century; the Bock Casements, an underground network of tunnels and galleries created in the 18th Century to add to the city’s defence systems; the Grand Ducal Palace, where the Grand Duke Henri, Luxembourg’s current reigning monarch, resides; or the 1,500 seat concert hall known as the "Philharmonie". With the “olde worlde” feel of the old town, its sophisticated squares and impressive churches, cobblestone streets and unique independent shops and boutiques, you’re likely to be enraptured by its selection of curiosities and overall charm. Outside of the capital there’s Vianden, a medieval city with cobbled streets and a castle on a hill. There are many festivals and events which take place in Vianden which celebrate its interesting past. To the southeast and the border with Germany is where you will find a small wine growing district known as the Moselle Valley that has produced some award winning wines. The oldest town in the country is Echternach, founded in the 7th Century. It has a lovely town centre with an abbey and if you’re into hiking and walking, there are various trails to discover and a rocky outcrop of cliffs and cascades known as “Little Switzerland” for you to explore. Or, you can head out into northern Luxembourg where the scenery is breathtaking. The Ardennes region is a landscape of sheer beauty, with valleys of woodland and the river that meanders down from the mountainous peaks, making it the perfect place for trekking or mountain biking. 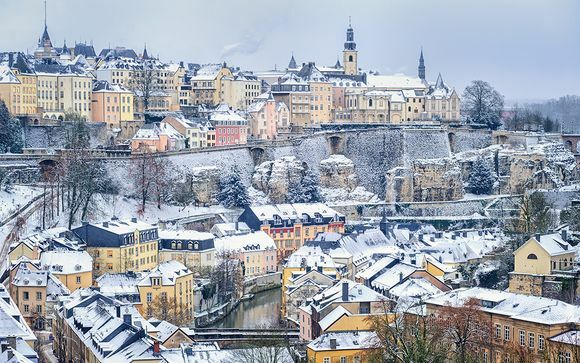 The real beauty of Luxembourg is its compact size, meaning that you can get the best of all worlds; a city break, moments of peace and relaxation or adventure and fun, all packed into one trip. With our exclusive offers and exceptional discounts on our handpicked hotels, you can be sure of an unforgettable getaway. Weekend breaks to Luxembourg: charming slice of northern Europe.